Specially for the ladies. Choose your embroidery colour. 10 colours to choose from, but if you would like a different colour, just let us know. The front flap & pocket flaps have oilskin / durapel lining to hide the back of the embroidery so you have a beautiful finish to your coat. You can see this in the photo because the top of the front flap is turned back. Camping, travelling, in town or out in the country. You might be working on the land, walking through the bush, or planning to travel ………….. You are invited to enjoy the high quality of our fabri.. Camping, travelling, in town or out in the country. You might be working on the land, walking through the bush, or planning to travel ………….. You are invited to enjoy the high quality of our fabrics, excellent workmanship and affordability of our Aussie Grazier, 100% Australian made in our own factory located at Slacks Creek, Brisbane, Australia. 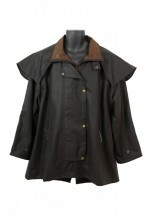 Features of our Aussie Grazier include: ► Made from excellent quality Oilskin or Durapel fabric (see tabs above All about our Oilskin and Durapel fabrics) ► &nbs.. Using public transport to get to work, travelling, going to a sports game in the cold or rain. 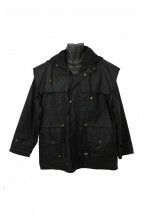 This versatile thigh length coat will keep you warm and dry no matter what you are doing. You are invited to enjoy the high quality of our fabrics, excellent workmanship and affordability of our Claybourn All Purpose Coat 100% Australian made since 1910 in our own factory located at Slacks Creek, Brisbane, Australia. Features of our Claybourn All Purpose Coat include: ► Made from excellent quality Oilskin or Durapel fabric (see tabs above Al..
Anorak or Parka, depends what country you live in, this coat is comfortable to wear and is my choice for a go anywhere coat for guys and girls. You are invited to enjoy the high quality of our fabrics, excellent workmanship and affordability of our Claybourn Anorak 100% Australian made since 1910 in our own factory located at Slacks Creek, Brisbane, Australia. Features of our Claybourn Anorak include: ► Made from excellent quality Oilskin or Durapel fabric (see tabs above All about our Oilskin and Durapel fabrics) ► ..
Classy looking coat with lots of pockets. 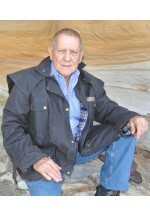 You are invited to enjoy the high quality of our fabrics, excellent workmanship and affordability of our Wildlife Man Short Length Coat, 100% Australian made in our own factory located at Slacks Creek, Brisbane, Australia. 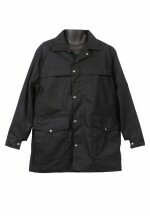 Features of our Wildlife Man Short Length Coat include: ► Made from excellent quality Oilskin or Durapel fabric (see tabs above All about our Oilskin and Durapel fabrics) ► Linings available in different weight fabrics from cool cotton to..